Dr. J. Michael Baza is passionately dedicated to helping men and women achieve lifelong optimal health. He is Minnesota's only physician to have served on the medical staff of Cenegenics Medical Institute upon certification in Age Management Medicine there. Cenegenics is the world's largest and most respected practice of its kind. Dr. Baza is a pioneer in shifting our health care paradigm from focusing on treatment of conditions to optimizing good health and preventing disease. Residency trained and Board Certified in Emergency Medicine, Dr. Baza practiced as a frontline emergency room intensivist for 17 years. After treating thousands of patients who came into the ER with avoidable serious illnesses, Dr. Baza became determined to make a difference in people's lives upstream of those conditions--when they could still be prevented or reversed. He decided to practice a different kind of medicine--a proactive rather than reactive approach to facilitating health. In 2003 Dr. Baza became one of only a few physicians in the country to receive certification in Age Management Medicine from Cenegenics Medical Institute in Las Vegas, Nevada. In 2007 he joined Cenegenics Institute full-time, treating patients as a member of its clinical staff and training physicians in the science and practice of Age Management Medicine on its medical faculty. 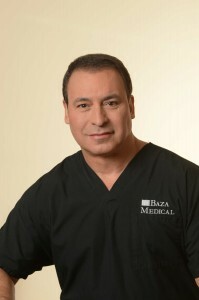 Now, as CEO and Medical Director of Baza Medical in Bloomington, Minnesota, Dr. Baza has created his own brand of interventional health optimization medicine. His practice is focused on understanding and treating the biochemical determinants of health concerns and fine tuning the body system, rather than on just addressing symptoms. He takes a comprehensive "whole person" perspective rather than a "siloed", single-specialty approach. At the forefront of this unique specialty, Dr. Baza applies the latest clinical protocols and evidence-based medical science to empower men and women to achieve their best health and well being, while preventing or reversing the decline that most believe is inevitable with aging. He is currently seeking Board Certification in Lipidology (specialty training in cholesterol issues and related diseases) from the National Lipidology Association. Additionally, his areas of special interest include: menopause, andropause (male menopause), hormone optimization, exercise physiology and human performance, nutritional supplementation, sexual health, nitric oxide biochemistry, metabolism and the underlying causes of obesity. Dr. Baza received his undergraduate degree in biochemistry from California State University, Long Beach. He was awarded a full scholarship and attended Harvard University's Health Professions Program. He then matriculated and obtained his MD from the University of California, San Diego School of Medicine and completed an Emergency Medicine Residency at Highland Medical Center in Oakland, California. "The Science of Aging Gracefully"
"Carnitines: Their Role in Cellular Aging, Erectile Dysfunction and Male Aging"
"Why We Exercise to Lose Weight and Why It Doesn't Work"